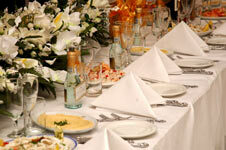 The menus have been specifically designed by our executive chef to suit a large range of tastes and budgets. At Aurora we are as fastidious as you are, not just in the choice of only the best ingredients and the selection of meals, but also in the style of presentation. Choice of menu either on an alternating basis or as a full choice is available. Our beverage selection is also attached these are inclusive of house bottled wines. Other wines are available price on application. Pre-dinner drinks consisting of sherry, beer, wine soft drinks, mineral water and orange juice. Tea of coffee served with after dinner mints presented with the compliments of the management. Selection of red and white wine, soft drinks. During the meal bottled house red and white wine is served with beer, soft drinks with champagne or spumante for toasts. Port is served with coffee at extra charge. Spirits are available at an extra charge.